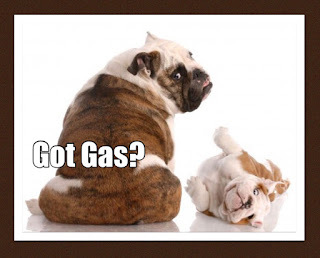 Does your dog's gas have you gasping for air? While an occasional stink bomb might be funny, if your dog's gas is regularly clearing the room, it's time to re-evaluate your pet's diet and overall digestion. Excessive gas and/or burping can be a sign of a health issue. Normal digestion produces gases in the intestinal tract. However, foul smelling gas is often caused by bacteria when undigested food (that should have been broken down in the stomach or small intestine) reaches the colon. Pets with poor digestion may suffer from bloating, indigestion, distension and discomfort. Consuming the wrong food or poor digestion are the most common culprits causing your pet to suffer from gas (flatulence), indigestion and stomach aches. Giving your pet probiotics and digestive enzymes with every meal can reduce gas and indigestion. The most helpful supplements for digestive issues and support are Soothing Digestive Relief, Gastro ULC, Power Probiotic, K9 Digestive (bigger dogs), and Lypozyme (smaller pets both cats and dogs). Diet changes are also essential. Eliminating dry food which is high in starchy carbohydrates which can be hard to digest can help. Avoiding food allergens can also bring a great deal of relief. If your pet has gas, there is an easy solution: change the diet and use a few enzyme and probiotics. Please include your pet's diet on the order form at checkout along with your a pet's health issues and Ask Ariel will include a diet suggestion on the packing slip that comes with the product directions. Have a question about your pet? Please feel free to email us at support@askariel.com Please know we cannot provide any veterinary consultative advice.